Paul Kelly (L) faces Sam Stout (R) in a UFC 126 lightweight bout. 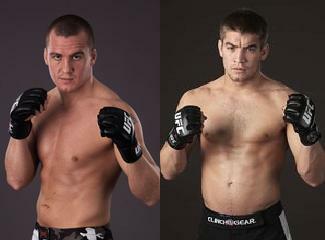 UFC lightweights Sam Stout and Paul Kelly will face each other in a UFC 126 bout on Feb. 5 in Las Vegas, according to Fighters Only Magazine. Kelly (12-3) improved to 5-3 in the Octagon with a second round TKO win over T.J. O’Brien at UFC 123 on Nov. 20. Against Stout he’ll be looking to put together back-to-back UFC wins for only the second time. As for Stout, his UFC career got off to a rough start, but he’s won three of his last four, most recently defeating Paul Taylor by split decision at UFC 121 on Oct. 23.